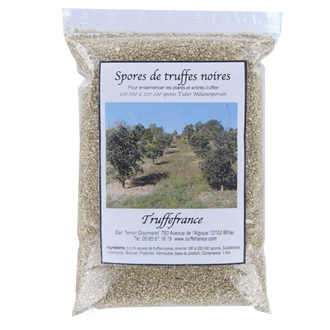 Black truffle spores to add to your truffle trees (Tuber melanosporum exclusively). This product is specifically designed to boost the mycelia and mycorrhiza in the roots of the truffle tree seedlings. It helps to accelerate the formation of truffle burn, prevent the proliferation of unwanted fungi and significantly increase the yield of the truffle bed through more homogenous spore dispersal. Technical details: 1 litre sachet containing: approximately 5 grams of black truffle spores, (between 100,000 and 200,000 spores), organic substances, glucose, proteins, vermiculite (product basis). Use: For trees where truffle burn is well developed sow using the "truffle trap" technique. Make a hole around 25 cm in diameter and 25 cm to 30 cm deep, 30 cm, 40 cm or 50 cm from the trunk depending on the age of the tree (30 cm for a 3 year-old tree, 40 cm for a 4 year-old tree, 50 cm for 5, etc.). Make 4 to 6 holes depending on the size of the tree and fill these holes with a mixture made up of 50% soil extracted from the hole, 50% organic substrate, and a bag of tuber melanosporum black truffle spores (1 bag of spores for one bag of organic substrate). Place 2 or 3 handfuls of this mixture in each hole then cover with the remaining soil. Depending on the region and if the weather is hot, water. Carry out the operation each year slightly increasing the distance from the tree trunk and staggering the position. Ensure you locate the roots in the soil to allow the truffle spores to infest them. For young trees around one or two years old, sprinkle this mixture around the tree and let it make its way down into the ground by hoeing the soil to a depth of about 10 cm. Repeat these operations every year in the truffle bed from the end of winter to the beginning of spring. In both cases the results are surprising. Hence the saying, "Sow now, reap later". On truffle-producing trees, the results may be noticeable the following year, but are generally apparent after 2 years.